Summertime and the living is easy. It’s time to fire up the grill. And grilling isn’t just for meat anymore, either. You can do virtually all your cooking on the grill – vegetables, foil pouch entrees, dessert, even pizza. Instead of spending sultry summer evenings broiling along with your food in a hot kitchen, why not plan to fix your meals on your deck or patio? Grilling adds no extra fat to your food, takes no more time than conventional cooking, and best of all, clean up is a snap. 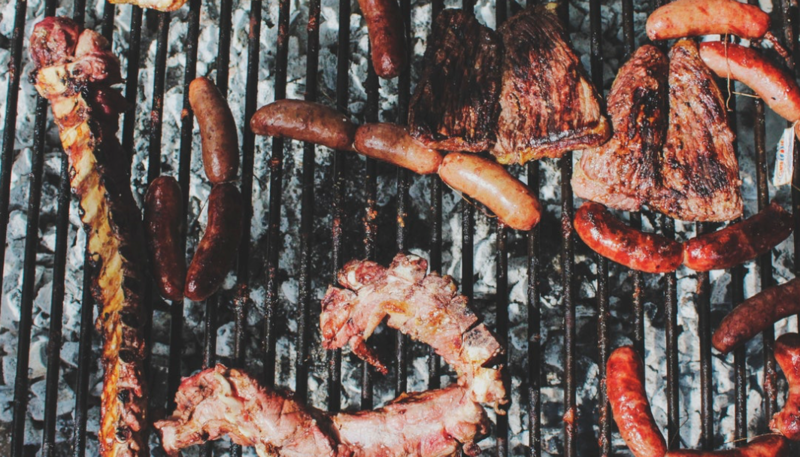 If you’ve never tried your hand at grilling, it’s time to learn this great American cooking technique. Let’s start at the beginning. What kind of grill are you going to use? Each type has its fanatical adherents, but it’s really up to you. Some of the pros and cons: Gas grills: are easier to clean; add fewer carcinogens to food; give you better temperature control; and require less prep time. Charcoal grills: are less expensive; add no gas taste to food; are more portable; and it's tradition! Most grills come with instructions – how to set up the grill and make sure it works properly and a cooking time chart. This is the part that confuses the most people. What’s the proper procedure for lighting a charcoal fire and how many briquettes do you use? How do you tell if the fire is hot enough? How do you know when the food is done to the point where it won’t poison your guests? Good questions, all. Below are some answers. With a gas grill, it’s a lot like a gas stove – turn on the gas and light it. Most gas grills even have temperature settings so there’s no guesswork. Charcoal’s a little trickier, but doable if you know the secrets. For one pound of meat cooked with the direct-heat method (smack over the fire), a good rule of thumb is 30 briquettes. For the same amount of meat using slower indirect heat, you’ll need about 50 briquettes. There are many ways to light a fire. Some use an electric heat element, some use lighter fluid, some use a charcoal chimney. Some even use gasoline, but we don’t recommend that (he lit a tree on fire in a Texas national park). Pile your briquettes in a pyramid before lighting. It takes about 20 minutes for charcoal to reach the proper temperature for cooking. It should be about 70 percent covered in ash with a faint glow. Spread the charcoal out so that it extends at least an inch beyond the edges of the food to be cooked. If you inherited your grill and have no instructions, here’s a time-honored method to determine temperature: hold your hand palm down over the fire about six inches above the coals. Count in seconds how long you can comfortably hold your hand there: 5 mississippis: 200-300 degrees Fahrenheit; 4 mississippis: 300-350 degrees; 3 mississippis: 350-375 degrees; 2 mississippis: 375 and above. What equipment is absolutely necessary? You need a good set of spring-loaded long-handled tongs for turning meats. Do not use a fork as spearing the meat will cause it to lose flavorful, tenderizing juices. A sturdy wire brush is absolutely necessary to clean your grill racks. While the racks are still hot from cooking, use the brush to remove stuck-on bits. For turning meat or serving, a long-handled spatula will serve you well. Different sizes of basting brushes come in handy. Skewers come in metal, wood and bamboo varieties. To keep the last two from burning up over the fire, soak them in water, fruit juice or wine for 30 minutes before using. Wire baskets and grids are great for vegetables and items that break apart easily like whole fish filets. l Remove and properly dispose of grill ashes as soon as they cool down. When mixed with water, ashes can eat through metal. l Arrange food at least ¾ “ apart for even cooking. l Keep children and pets away from the grill when it’s in use. l Set up your grill on a flat even surface. l For gas grills, don’t store extra gas tanks under or near the grill. l Don’t wear loose, flowing clothing when working with fire. l Use nonstick cooking spray on grill racks, but don’t spray it over the fire, which can cause flare-ups. l To prevent charring, which adds carcinogens to your food, trim excess fat, put on sauces near the end of cooking time, use the higher racks of your grill and keep your grill clean and well-oiled.